The lobby had blankets thrown over the furniture which made it look very shabby, and every machine, the coffee machine, snack machine etc. had out of order signs on them. Although the room was spacious, it had very little decor. There was no elevator. The bed was not very comfortable, hard edges on the mattresses. Very small television. View out of the window was not good. The breakfast was okay. The pool and hot tub were also out of order. Perhaps after the remodel it will be better, but I would not stay here again. So this hotel is under new ownership and is now the Moab Gateway Inn. The new owners did some nice renovations but that has resulted in a pervasive toxic smell of VOCs from tub refinishing/painting/etc. It was giving guests headaches and there is nothing they can do to help. If you are thinking "oh maybe I'll risk the cancer for a nicely renovated place", don't. There was still poop splatter on the toilet to make the nice new bathroom feel gross. On the plus side, the front desk staff was friendly and they have free breakfast of Cheerios, yogurt, and waffles. This is the most disgusting room I have ever stepped foot into. When I first checked in I noticed a strong smell in the lobby. I hoped it wasn’t throughout the hotel. I later found it was. Walking to my room I noticed the disgusting carpets, stairwell and walls. Nothing has been vacuumed and cleaned in this hotel for who knows how long. But the room we walked into was far worse than anything you could imagine. The bathroom was vile -the toilet seat was covered in pee spots, the base of the toilet was smeared with crap, the mirror had spit and toothpaste speckled on it, the bottom of the tub was black, the walls of the tub were smeared with dirt and grime, several spots around the tub had small dark curly hair (pubic hair with your bath anyone?? ), there was a light colored hair hanging down from the towel rack, multiple towels had dark hair on them and one towel had blood on it. The rest of the room wasn’t much better. We opened a window to try and get rid of the smell. The bedside table was dirty and had strands of hair on it, the lamp was stained and covered in dirt and possibly mold, the window seal was dirty, the headboards were covered in at least an inch of dust, the tiny fridge was dirty and stained, the table with the TV also had dirt spots. The bed did not have a plastic covering which worried me due to the neglect the rest of the room had received. I immediately called down to ask if they had a room that had actually been cleaned and explained the situation I had walked into. She was unapologetic and told me they had no other rooms with two queen beds available. She didn’t say more. I asked how she expected me to stay in a dirty room like that. She told me she’d call me back. While I waited I frantically started looking for another hotel that wasn’t booked for the night. Luckily I found one. When the receptionist called back she told me she could try and get a maid up to clean the room. I told her I’d found other accommodations and would be down for a refund. She said she couldn’t do that. I persisted and she said she’d call her manager. I then walked down to the lobby. When I got down there she rudely told me she was trying to reach her manager. A minute later she came back up to the desk to start issuing a refund. She told me she’d have to deduct $20 for a housekeeping fee since the room would have to be cleaned for the next guest since we were in there. At this point I got quite upset and started showing her my pictures. A few guests then came to check in. She told me to wait and checked them in. They’d heard part of our conversation. When they left she told me she’d give me a full refund when I prodded again. She then rudely told me I should have made her aware of the situation sooner. I had just checked in ten minutes prior. When I told her that she checked the time stamp on my check in receipt and then made some excuse about being really busy. This is the worst service and hotel I’ve ever set foot in. They acted like these conditions were normal and that I was crazy to complain. They just recently changed their front sign to the Gateway Inn. As if changing the name will make it better?? Do NOT stay here. It should be shut down. It doesn’t even deserve one star. This was two days ago. I’m still waiting for the refund to process. 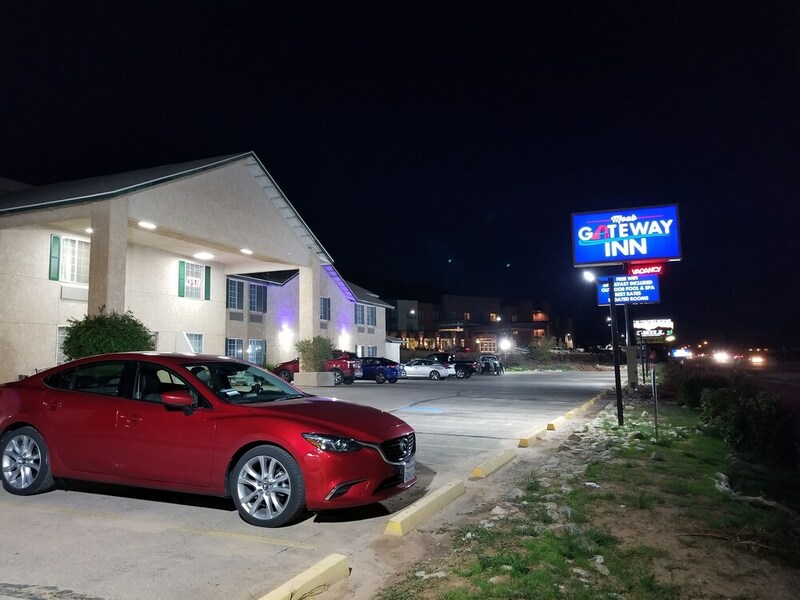 Since new owners took over in April 2018, this motel has been in renovation. Trip Advisor reviews in October 2018 had been 1 Star. But, I had booked 5 days here before reading them and was concerned. The day I checked in, the front desk person let me view the room which was acceptably clean -which relieved my anxiety about cleanliness. Their room rate was the best I could find so I stayed all the days. The breakfast room, though cramped at peak time was always clean and had a nice selection of breads, yogurts, cereals, make-your-own waffles, apples and bananas. The rooms upstairs had been renovated including new mattresses. My mattress in room 101 was not new and I’m knocking off a few stars for lack of sleep and stuff that they had yet to do to finish their renovation including changing out lamp shades and frayed curtains, adding an iron and ironing board, and replacing the old, cracked leather couches in the lobby and old rugs, putting an ice bucket in the room, fixing their vending and ice machines etc. I take a couple blankets along if driving my own car. If the heater is noisy, I can still be comfy despite the thin bed coverings motels provide these days. So I’d give the “new” Gateway Inn a try in the future if the rate stays so affordable. They’re working every day to improve it. The staff was friendly and helpful. They put up the big, new hotel sign the day before I left. Just be sure that your room has a new mattress. Location. You will be in Arches National Park in 5 minutes and in downtown Moab in less than one minute. This place is family run which is nice to see. We were here during a very busy weekend and all of the hotel rates were inflated so we paid double the regular rate. Perhaps at the off-season rate this hotel may have been worth the money. The hotel itself is badly in need of renovation. We brought our sleeping bags inside and slept on top of the beds instead of in the sheets. (I do this a lot in older hotels.) Hot shower with great pressure. Soap and clean towels... after camping in the rain you really can't ask for much more. The fridge is really small and the TV is blurry and outdated but has basic cable. Breakfast is also very average. They have one of those make your own waffle machines if that is something you fancy. Mostly just bread and donuts. I was happy to find yogurt and a few pieces of fresh fruit. The coffee is served in really tiny cups so you can't take it to go. Bring your own mug or better yet head to one of the coffee shops in town. The pool is full of debris and the hot tub was ice cold. We were here in October so we weren't exactly planning on swimming anyway, but the hot tub was a letdown. Hopefully that is something that they fix in the near future for upcoming guests throughout the winter. I wouldn't be too hopeful. We noticed most of the other travelers here were backpackers from other countries so this may be a good place for solo travelers wanting to meet new people. Moab is beautiful and you really can't go wrong with any hotel because you are not going to spend a lot of time there anyway. All you need is a bed and a shower. I would stay here again solely for those purposes. This hotel was so bad that we checked in and checked out within an hour. Mattresses and air units were stacked up in hallway and outside. Boxes were piled up in the lobby. Vending machine out of order. Staff didn’t care about anything. They should be shut down. Do not stay here. As the other recent reviews stated this place is unacceptable. If you’re only expectation is clean towels then you will be content. If you expect a clean room and clean common areas then look elsewhere. This picture of the tub should tell you all you need to know. Did not capture the mildew on the shower curtain but take my word for it. Do not stay here the room smelled so bad that we could not sleep, the carpet was dirty. the bed had no mattress cover so was very uncomfortable. The bathroom- the toilet paper and Kleenex holder were falling out every time we used them the tub did not hold water.and was very noisy. For the price it should have been a lot nicer . Will never stay again. The Riverside is just awful. Dirty and boxes stacked up in lobby. Torn couch and vending out of order. Shower dirty and staff could have cared less. Breakfast awful also. The place should be inspected and closed down. Shame on the owners. Don’t even consider giving it a try. Within a short walk of Swanny City Park, Moab Gateway Inn is within a mile (2 km) of Grand County Civic Center. This 51-room hotel has conveniences like free breakfast, an outdoor pool, and free in-room WiFi. Free continental breakfast is served each morning from 6:30 AM to 9 AM. A flat-screen TV comes with cable channels, and guests can stay connected with free WiFi. Beds sport premium bedding. Renovated in 2018, Moab Gateway Inn offers an outdoor pool, free WiFi in public areas, and a business center. There's free parking if you drive. Front-desk staff are standing by 24/7 to assist with any requests. Additional amenities include a seasonal outdoor pool and laundry facilities. Free continental breakfast is served daily from 6:30 AM to 9 AM. Recreation features at Moab Gateway Inn include an outdoor pool.